Even geniuses make mistakes. The best Magic players still use no-brainer techniques to avoid blunders. We can use those methods, too, and come up with some of our own. By not stumbling over simple errors, we may better focus on higher-level strategy. Last week in Foolproof Magic, we learned methods to avoid confusion over land drops and to remember triggered abilities. This week, we’ll master improve our management of morphs and complex board states. Forgetting to reveal a morph at the end a game is a catastrophe. At a 6–0 table at a Pro Tour Qualifier, my friend had to extend his hand in defeat to his opponent, who promptly shuffled his morph into his cards and found a way to lose a match he’d already won. Brad Nelson will never receive such a game loss because he removes his morphs from their sleeves after playing them. He won’t shuffle the naked card back into his hand or deck by accident. Here, we can see Brad’s strong and confident hands pulling a morph from its sleeve. Once he unmorphs the creature, or it dies, he can resleeve it, but never before revealing the card. The method is also championed by Pro Tour winner Ari Lax, and I will be using it at both Friday Night Magic events and at Grand Prix San Jose. Why would I look at the back of a card when I could use a morph token with its warm and friendly fireball of mystery? I place the tokens on my opponents’ morphs as well because I’m a gentleman—that and I want to be certain to slap my Debilitating Injury on the second morph played. Morph management is more relevant in Limited play, but we can improve our Constructed game as well by adding method to the way we lay cards on the table. Different deck strategies bring different flavors of complexity. The first problem we’ll discuss is one very close to my steel heart. Piloting Affinity in Modern is no simple task. It functions less like a beat-down deck and more like a creature combo—all those gauges to watch and levers to pull to maximize damage output. Players considering buying into the deck should see video coverage with pros frantically counting or squeezing their heads between their hands with the strain of deciding how to maneuver their Arcbound Ravager counters. I simplify the counting by arranging my artifacts in a pattern of twos and fours. I tally groupings, not individual cards, and at a glance, I know I have eight artifacts in play. Cranial Plating can’t be grouped in a pair unless it’s equipped, and when I do latch it onto a creature, I turn the Equipment upside down. Activated man lands move up into the artifact grid for counting. In this engine of doom, the mana producers are always on the left of my control panel. The Spellskite is always on the right. I never have to search and scrounge for the permanent I need. I’ve created these techniques while practicing with Affinity. Other decks will require innovating new strategies, and that’s exactly what Ivan Jen did to deal with the brain-busting complexity of his Jeskai Ascendancy deck. Look at all the tricks Ivan Jen uses to turn confusion into clarity. He leaves his spells Ajani's Presence and Retraction Helix on the board to show which creatures they’re enhancing, like they’re until-end-of-turn Auras. Dice indicate the bonus each creature has received from Jeskai Ascendancy. I’d recommend placing the die just below each creature to allow for no confusion with permanent +1/+1 counters, a possibility with Favored Hoplite. When casting Dragon Mantle on a creature with heroic, lay the spell over the target. Then, place all triggers on the stack (Jeskai Ascendancy first so it happens last). If the spell resolves, move the Aura behind the creature, and at the same time, announce the trigger to draw a card. Practicing precise technique will help us remember all the triggers in high-pressure situations such as feature matches. Another deck that can create a maze of permanents is Legacy Elves. When the elvish party is in full promenade, turns can go long. It would be easy to forget if Quirion Ranger and Wirewood Symbiote have already used their once-per-turn abilities. To solve this problem at Pro Tour Berlin, LSV placed a counter on those creatures after using them. Other players turn those cards face down. I suggest the upside-down method. Turning one Quirion Ranger backward indicates that she’s already used her ability that turn. This avoids any possible confusion, as a counter could mean +1/+1, and turning the card face down might mean a morph. Sometimes, all the action isn’t on the battlefield. Players going off with Storm decks might lay their enormous hands face up on the table to hasten their rates of play. I use a twenty-sided die to keep track of my storm count. Dice or counters can also record the amounts of mana floating. Bonus Foolproof Tip: Above the names on the life pad, I’ll write P for whoever goes first and M for each mulligan taken. This way, I’ll have an accurate record if there’s a judge dispute over the number of cards my opponent has drawn over the course of the game. 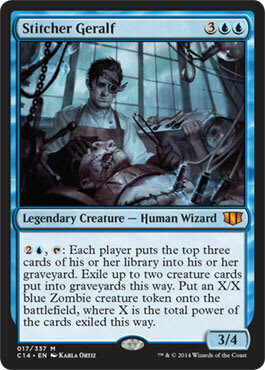 In a Dredge deck, the hand is less important than the graveyard. Stacking the ’yard in one pile hides most of the relevant cards and makes it more likely the player will forget options like flashback. Instead, give those crypts the light they deserve by spreading out the graveyard. In my casual Golgari deck, I sprawl the graveyard over half my play space. It’s everything beneath and to the left of my library. That’s all I’ll cover in this week’s Foolproof Magic. What techniques do you use in your decks to simplify the board state and avoid mistakes?